Perla is an elegant 7-cabin gulet able to accommodate up to 12 guests on cruises in the beautiful waters of the Adriatic. We use Perla for a number of our scheduled gulet cruises in Croatia as well as for private expert-led charters. With a beautiful teak deck and mahogany hull, she is sleek and comfortable with 5 doubles and 2 twin cabins. She is spacious, full of character and is fitted out with all standard mods cons. Visit our general Gulet Cruises page. The tour of the "Dalmatian Coast" was one of our best vacations we have ever taken. The gulet was an experience you will never forget and the crew and guides are wonderful. Croatia is like something out of a dream. The history, people, food, and wine is something that will always stay with you and don't forget the shopping! My wife and I would recommend this trip to everyone no matter what age. 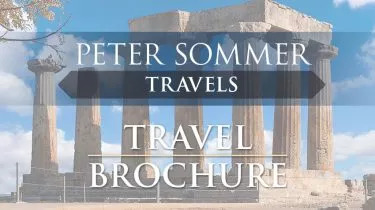 We will be using Peter Sommer Travels again. GO! GO! GO! A gulet cruise from Dubrovnik to Split taking in many beautiful and interesting islands along the way. We were two of eight passengers with an excellent guide and crew of 4 looking after us. The food was incredible with 3 courses plus wine for lunch and dinner. One of the best things was the lack of decision making required on our part. Everything was seen to. Our tour guide was an expert in the archaeology and history of the region and an inspiring story teller. She was backed up by local guides where appropriate. We were so impressed that the group is organising a further visit to the Greek islands through PST with the same guide.